Looking forward to yet more adventures in the van in Europe as we flew out in the evening on an Emirates 777-300. A reasonable flight, broken by a short and rather weird stop in Bangkok. Passengers were discouraged from disembarking for the half an hour or so that was possible, so that those staying on to Dubai spent the time trying to keep out of the way of the hordes of Thai workers doing their best to clean the cabins and clear all the rubbish. Arrived Dubai early Monday morning. To ensure arrival in Heathrow in the morning, to avoid the necessity of a hotel, we chose to stay the day and part of the night in the huge Emirates business-class lounge instead. (Although flying economy, we get lounge use through Michael’s high status as a frequent flyer, and on each leg the senior cabin attendant came and welcomed him aboard – again!) That worked out quite well, although a bit boring, and we caught up on our reading and sleep on one of the several lie-down couches in the “quiet lounge” and elsewhere. We walked along the famous airport shopping mall and back, good prices but no purchases! And of course there was endless good food available at many counters in the lounge, not to speak of excellent wines and spirits. It became nearly deserted in the late evening, and there are probably worse places to while away most of a day. The Dubai-London leg was in the big A380-800, with good seats by economy standards (but still not as good as Asiana) and an excellent AV system. Even Norma watched several movies. Pretty quickly through Immigration and Customs as EU citizens with priority passes, and down to the tube station well within an hour of landing. About an hour and a quarter to Waterloo, and then a bit of a wait for the conservatively pre-booked 10:30 train across to Gillingham, Milton Farm, and the van. All well there, no signs of mice or freezing damage. So peaceful afternoon, mostly sleeping – very cool, as expected, with northerly wind, but dry so far. England is suffering from a very late spring, and for the first time at the farm we are surrounded by trees still bare of leaves. Good night, and very pleasant rural drive up to Katie’s great new house in Clehonger, on the outskirts of Hereford. Happily caught up with family and other doings. Amazingly warm in the afternoon, sitting in her sunlit conservatory. Colder again in the morning, with strong wind. Drove down to Southampton in continuing cold, windy weather, with frequent showers. 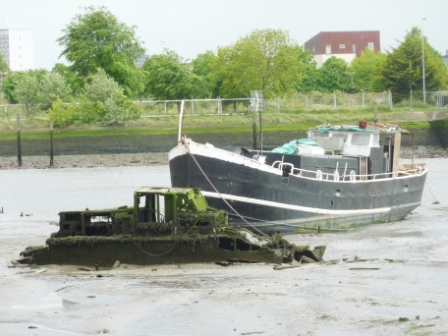 Some shopping at Towsure camping supply shop, then to regular overnight spot in car park by unused factory complex overlooking muddy, wreck-strewn upper reaches of Southampton Water. Again, quite warm when the sun shines into closed up van. Some rain overnight and gloomy, windy start to day. In to Fiat service centre Adams Morey 8:00, usual good welcome (good customers!). Given a lift into Southampton after MOT completed, and then a shopping walk down the high street. Malls looking prosperous, but many shops changed and some boarded up – signs of recession around. Did the registration at the Post Office, then met up with Norma’s twin cousins Colin and Chris for lunch at help-yourself Chinese restaurant, excellent value as ever. Taken back to van by Chris, then got two full 6 kg gas bottles from Calor depot. Had thought of driving to Wrotham to meet up with Paul, but weather really closed in during the day, with cold winds and squally showers. So returned to our place overlooking the waterfront, muddy at low tide but picturesque in its way. Norma’s birthday! Weather much more pleasant, sunny but still cool. First down to Beaulieu and the National Motor Museum, and caught up with our good Australian friend Paul Hamilton. Excellent display, as ever, but more limited in scale than some of the other car museums in Europe. Then to Bucklers Hard, and an unwholesome lunch at a cafe outside the entrance to the historic area – didn’t find out until too late that the old pub near the water within the complex looked a much better place to have eaten! From there, longish drive to Brands Hatch, marvellously revamped since when I first raced there in 1960 (watched without, then, great enthusiasm by girlfriend Norma) and the venue for the big Masters Historic race meeting. Camped in an open part of the camp site field as for last time. Met up with Paul again, and after a quick look round the lower paddock and a look at the Elva Courier that he was going to co-drive with Amanda Hadfield, with him a wine in the van and then a just OK meal in a pub near Wrotham. Given passes to the Masters Racing hospitality marquee by Masters Racing series owner Ron Maydon, watched qualifying and racing during the day. Featured were the new FIA Masters Historic Formula One Championship (3-litre F1 70s and 80s era) and FIA Masters Historic Sports Car Championship, as well as the HGPCA races for pre-1965 F1 cars. Some very good cars, including the ex-DD Lotus 25 in which Jim Clark won the World Championship, now owned by the very pleasant Australian John Bowers. He remembered me giving a road safety lecture, must have been in the early 70s! Unfortunately his pole-sitting car, driven by Andy Middlehurst, suffered an electrical problem that would take him to the back of the grid for Sunday. All went well otherwise, under blue skies but still with the freezing cold nor-easter. Lunch and dinner in the Masters marquee. The main day for the meeting. Paul and Amanda qualified Simon’s Courier in the morning, both groping a bit for their first time on this great circuit. During the F1 and sports car races I walked up past Druids and over to see the extended “back” part of the circuit, on which I never drove in period. 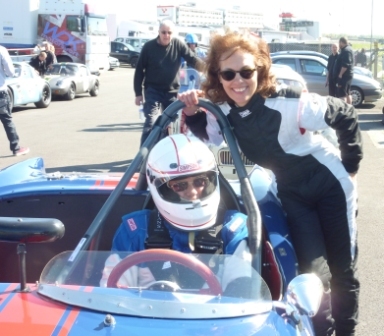 The “Gentlemen Drivers” event, in which Paul and Amanda figured, was last on the program, 90 minutes split between the two – finished well but not near the front of the field, which had some hard chargers in very quick cars. Paul came up for dinner on the van at the end of an enjoyable day – although for him, it would have been more enjoyable in a single-seater! Weather clamped back in overnight, so in rather dreary (a weather word currently often used in Britain!) drove down to Dover on the first leg of a quick journey to Paris. Stopped on the waterfront opposite the ferry discount place, and booked the cheapest in the morning, £65 on MyFerryLink, which has taken over Sea France. Not the cheapest trip ever, but needed to get down to Paris today. Calm but overcast crossing before yet again messing up leaving Dover, this time because the Tomtom was set to avoid motorways, a hangover from its last use with the Europe maps. But once sorted out, and having missed the grand Autoroute, had a quite pleasant run down – except, again, for absolutely foul wet, windy weather. Reached the Bois de Boulogne camp site by 6:00 pm, in time for a drink and dinner. Site becoming very run down, with a major 2013-2014 renovation just beginning (starting with the office! ), but expensive at nearly €40 a night. Shuttle bus and Metro into the Place de la Concorde, for yet another meeting at the FIA, this time the FIA Historic Motor Sport Commission. Commission member Paul there too. Invited by chairman John Hughes to describe my work on amending and updating CAMS medical standards several years ago, and ended up being nominated to a working group to prepare a submission for FIA changes. Poor prospects of success, I suspect. Joined up with Peter Wright and Andy Mellor over lunch, as they were there for a meeting of the Safety Commission. Confirmed that it will be impossible for me to make the Institute research groups in June. Some sun in afternoon, so killed an hour sitting in the Tuileries before shuttle and Metro back to the Bois de Boulogne. Main aim was to get south and out of this terrible “spring” weather, but after getting away at 9:45 had a pretty awful run out of Paris via the Peripherique. Headed south-east through Champagne-Ardennes and Burgundy, and conditions improved after Troyes, when the road became attractively rural, with countryside gradually rolling into gentle green hills. But spring not yet sprung, with nearly bare branches on trees and shrubs. Rain off and on all run, sometimes heavy, and all overcast. Norma by now nursing a rotten British cold, known there as “just a sniffle, not infectious”, which is how Chris referred to it as he sniffled at lunch in Southampton! Norma appears to have little resistance to the British virus. Finally arrived at 4:00 pm at a pleasant motorhome aire in the little village of Fontaine-Francaise, in mid-east Burgundy. Settled by ourselves on the bank of a little river, very pleasant and peaceful, and even a splash of sun at 6:30. Tried to get on the internet via mobile data, but no sufficient signal. Lots of planning – will the Alpine passes be open? Rain came in overnight, under an overcast sky. Picturesque little aire, though, watching the ducks and big fish in the little river (“No Fishing” signs). Because of the rain, forewent a walk into the village, and took a cross-country route down to Dole and a McDonalds for the internet. Coffee and croissants really very good, and a cheap accompaniment to over an hour with the iPad and the laptop both running, catching up with Norma’s book orders and a lot else. Then more cross-country driving, by now in terrible weather, rain steadily pouring. Would have been a scenic run, especially latterly, starting up the foothills of the Alps in Franche-Comté. But took an early stop at about 3:00 because no point in pressing on under such conditions. Internet forecast intimated some improvement tomorrow and over the weekend, but the local paper suggested heavy snow and good skiing for the time of year, so hard to know what to expect. According to the paper’s article, the weather is “completement exceptionel et incroyable”! Chosen aire was one we have been to before, on the shores of the dammed Lac de Vouglans at a marina facility, La Mercantine. However, entry to the park overlooking the marina and the water is now closed to motorhomes, and we were directed to a large car park in the trees, but with no view of the lake. Only one other van there. Sat out the afternoon watching the rain continuing its relentless fall. It’s nearly 30 degrees in Turkey, we learnt this morning, but when will we be there? Rain eased a bit by morning, but still damp. Got very foggy as we traversed a mini-col, but once down again and in the Rhone valley things improved. Came down to the west of Lac Bourget, on which Aix-les-Bains stands on the eastern shore, and pulled into an aire outside Camping International l’Isle aux Cygnes. A good aire, including free wi-fi, so we caught up again on the internet and Norma’s orders. Another benefit was supposed to be access to the camp site’s showers and loos, but the facilities turned out to be extremely scruffy, not to say dilapidated, so we only made very limited use of them. Had a little walk down to the lake and into adjacent woodlands to see the ruins of a 14th century chateau, but then it started raining again. Rain stopped overnight and, astonishingly, some sunshine and warmer weather first thing. Forecast for today quite hopeful. Away down through Chambery, an industrial sort of place, not really as expected, then a pleasant drive north-east along the valley of the river Isere, some snow-topped mountains appearing through the scattered white clouds. Went on up to Albertville, aiming for the Little St Bernard Pass, but not really to our surprise it was closed – along with all the other passes in the Rhone-Alps leading over to Aosta. So, plans changed, and after a short back-track we headed south-east to the Col du Mont Cenis, the only open pass to the east, not to speak of the tunnels that we wished to avoid. We drove along another river valley, with extensive bauxite mining operations along its banks, and past an interesting range of fortifications arrayed across the whole valley, the Esseillon Barrier. This is a set of four forts erected in the 19th century by the kingdom of Sardinia to protect the approaches to the Mont Cenis pass – why, and what the interest of the Sardinians was anyway, we have no idea. The pass was relatively easy, and obviously strenuous efforts are made to keep it open as long as possible. Reasonably high, though, at about 2,000 metres. 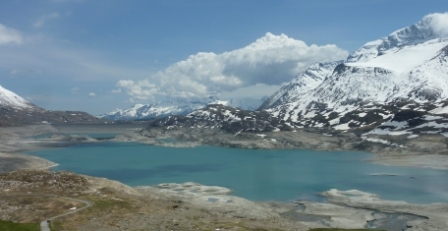 At the top is a lovely blue lake, caused by damming the river that flows out eastwards and provides hydro power, mainly from melting snow I’d have thought. Lots of picturesque snowy mountain tops all around. Then a long drop down into Italy and the need to get used to, once again, the loony driving habits of many of the Italians. Planned to stop at the village of Susa, with its dramatic Roman gateway, but the parking area was full and the market area packed out – so continued on to Avigliana, about 15 km west of Turin, where we settled in a large motorhome-friendly car park along with a few others. As soon as we dropped out of the mountains it had become quite warm, and so we pulled put the chairs for the first time and sat in the sun. However, to the call of “ooh, la-la” from a neighbouring French lady, thunder and lightning came our way, along with some rain. But not being cold makes a change. A good day’s driving. A long way across Italy today, through Piedmont, Lombardy and into Emilia-Romagna. Clear blue skies to start with, but clouded over – but quite warm, and used the van air-conditioning for the first time. On the run of nearly 400 km to Modena we first chose to stay off the motorways, which are all tollways, staying instead on the major roads which, on a casual glance at the map, seemed simply to parallel the autostrada. But in fact the roads twisted and turned through countless towns and villages. That wouldn’t have been that bad, but the scenery was flat and uninspiring, and the areas commonly industrial. So at Tortona, about half way and not making good time, we took to the autostrada and zoomed through to Modena at the cost of about €13, not bad, cheaper than France. I thought driving standards were better on the autostrada, too, better than in the little towns. A shower on the way over, but we missed the worst of it – mostly partly overcast and a bit muggy. At one of these little towns we stopped to shop at a suburban supermarket in a poor area – got some chicken livers and hearts, to be eaten later with Pappardelle al Ouvo and a rich sauce. Delicious, and a very inexpensive meal. Headed down towards Maranello, and aimed for an aire at nearby Castellanare. However, like a similar parking area we sought out in Modena, the motorhome part was closed in favour of a fair – not that any part of the tents and buildings of the festa showed any sign of activity, which had featured a couple of days ago apparently. So pulled into the adjacent car park, acceptable. An unusual feature of this park was a pure water-dispensing machine. This was a sort of stall with three taps, for ordinary water, cold water and fizzy water, all somehow electronically purified and filtered, with the trace elements listed on a label. The whole affair was apparently self-contained and was extremely popular, with people coming with sets of bottles almost constantly. All free, and provided by the local council. We decided that the town tap water must be pretty awful – but even in places like Sydney people buy bottle water and would flock round a machine like this! Dawned bright and sunny with a few white clouds, increasing, but generally pretty good all day. Cleaned up at convenient facility in the festa bit we weren’t supposed to go to, then via a selection of side roads to Maranello. Obvious aim was a return visit to what is now known as the Museo Ferrari, previously the Galleria. The red, yellow and black colours of the Ferrari brand are overwhelming in the Museo and in the town for that matter, as are the prices in the museum shop. In a couple of books in the bookshop I get a mention in relation to the Sigma, and even one picture. But no Sigma there this time, again, as the theme was ”supercars”, from the 250GT to the brand new (uncomprehendingly named) LaFerrari. I think I liked it more than Norma! The layout and presentation combined as a spectacular demonstration of why Ferrari is such a powerful brand, all wonderfully done. On the way out we saw that a van with Australian logos all over it was parked next to us. They arrived as we got back to ours, and introduced themselves as Struan and Krishna from Queensland, out for 18 months and having done a very good tour, from Morocco to the Arctic Circle. Were previously towing a Porsche 911 to take back to Australia, but he crashed it at the Nurburgring, and it was now being repaired. Aimed to go sailing, so we promised to keep in touch. Decided to take the autostrada to Ancona, seeing lots of flat countryside with the tail end of the Apennines to the right as we drove south-east, a fairly easy run, making tracks. Over some hills latterly, and down into Ancona and a sosta in the foothills some 4 km from the centre. €10 bought us some security and electricity, but not enough of the latter to cope with Norma’s new 750W hotplate, so evening menu was changed at last minute. Lots of vans in storage here, and only a handful in transit. Pleasant late afternoon and evening in sunny conditions. Very quiet night, with only a couple of other tourers. Filled up with water at convenient tap, cleaned the windscreen and front of van. Then down into Ancona, parked and walked to port area to see about getting tickets. Found Minoan Ferries office, but to get tickets for today we needed to take the van down into the port area. 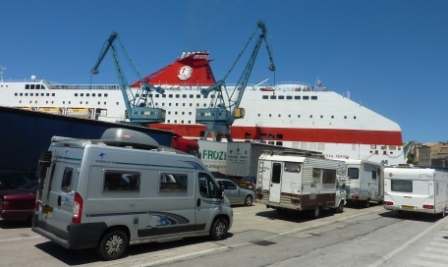 Once we got there, it was obvious that this was what we should have done in the first place, with an Ancona Ferries Terminal office building for all bookings and a large free car park. Always easier the second time! The ticket for Ancona to Igoumenitsa in Greece cost €236. This covered the van and us, an internal cabin and an evening meal as the “camper special” deal. Before this new ship was introduced a year or two ago, campers could stay on their vans, but this was longer possible because the garages would be locked up. This a pretty good deal if you’re trying to make tracks, as we were , as the alternative is to drive at least 1,300 km round via Croatia, Bulgaria and Macedonia, which would take days and a lot of fuel. Anyway, it would be a bit of fun and an unusual adventure for us. Drove down to the port assembly area in good time – lots of confusing instructions and signs and gesturing men. Established near the front of the grid, and then watched scores and scores of large trucks and a good many cars lining up with us. Then the ferry pulled in, a huge ship with three stern loading ramps so that unloading and loading started immediately. Trucks, cars and vans were all loading simultaneously, group by group, with more waving, but the process was delayed by the need for most trucks to reverse aboard, needing to turn right round on the dock. For some reason our line of vans was last on, although lots of vans had been in other lines. Drove aboard easily, then up a narrow ramp inside. We were then were instructed to make a u-turn in a big open space in front of an assortment of vehicles. We thought we were then to reverse into a position in front of the existing group – but no, we were motioned to reverse up a narrow slot up the side of the deck, between a barrier and the ship’s side. Being waved at and motioned by three deck hands was not a lot of help in this process, because it was not at all clear what we were supposed to do or why! Eventually settled, an Austrian reversed into position in front of us, equally relieved he had made it! Plugged in our power cable so that the fridge could run on mains – use of gas not permitted in the garages (another reason not to let people stay on their vans). Up in the ship we checked in at reception and got our allocated cabin, a claustrophobic little space but with its own shower and loo, and loud and very cold air conditioning until we managed to turn it off. Finding our way round the ship became something of a mystery only just being solved by the time we disembarked. The interior of this two-year-old vessel was very glitzy, featuring lots and lots of mirrors and mirrored panels, chrome handrails and multiple sitting areas. We finally settled in the quietest area, the front main lounge. During the afternoon lots of passengers stripped off and sat in the sun around the (empty) small swimming pool and bar on the outside top deck, but among other things the 80% who were smoking put us off that option. It was also very windy once we got under way. Sat and read for a while over a litre of draft Becks, then after a shower and some wine in the cabin we had dinner in the self-service restaurant, following a special line for “camper specials” that had a more limited choice, but ample. Chicken stew, quite tasty. More reading in the lounge as night fell, nothing to see outside. Reasonable night but the little cabin got very stuffy without the air conditioning, so had to get up and fix it to run slowly. Up in the morning to see the coast of Albania passing by to port, and Corfu just visible in the distance. Breakfast of coffee and a sort of chocolate croissant. Scenic passage between the mainland and Corfu before final approach to Igoumenitsa, arriving about 10:15 am Greek time, just over 18 hours from departure. The aim was to travel fairly quickly across northern Greece to Turkey, but as a start (after a stock-up at a busy Lidl, where Norma was reminded that being polite to two determined black-clothed Greek ladies does get you access to the choice of food) we took a very scenic route north-east from Igoumenitsa through Epirus along some narrow, winding but very quiet and well-surfaced minor roads up into the foothills of the western Pindus mountains. A terrific run, as it turned out, and although we finally rejoined the motorway we enjoyed winding around its route while admiring the several huge viaducts and tunnel entrances of this new and high standard EU- funded highway. We joined it at Metsovo, went straight into an 8 km tunnel, and then experienced for ourselves an astonishing piece of mountain highway engineering, at a very low rate of tolling by European standards. And very quiet again, too, so we were able to enjoy the scenery more than is usual on busy and stressful Euro motorways. We carried on through Western Macedonia to the little town of Vergina and stopped at about 5:30 in a large, almost deserted, car park, mentioned in one of the blogs we had studied over the Australian summer. Pre-dinner drinks sitting outside, in the warm Greek sun. A German van kept us company overnight. The reason Vergina has a large car park is that just outside the village is one of the most important archaeological sites of Hellenistic Greece, and a World Heritage site. This is the location of the city of Aigai, a highly important centre on the route southwards, and dominant as early as the 10th-8th centuries BC. The people were the Macedonians and the region was Macedon. The Royal Palace at Aigai covers an area of 12,500 square metres, but only foundations and low walls are currently visible. During excavations as recently as 1997 archaeologist Professor Manolis Andronikos found the entrance to a tomb and bones in a burial casket, as well as an astonishing collection of golden and other artistic and practical objects. The conclusion was that this was the tomb of King Philip II of Macedon (393-336 BC), from a long line of Macedonian kings. Philip was the first ruler to unite the whole of Greece as it was at the time. His son Alexander II (The Great) was proclaimed king when Philip was killed by an assassin, and went on defeat the Persians, declare himself King of Asia and subsequently establish an empire extending as far as India. Philip’s tomb and three others have been partially excavated, and are all now covered over with a domed roof as a simulacrum of the original earthen tumulus. The museum is outstanding in its presentation of the tombs and their contents. We found most remarkable the astonishing frieze paintings and the gorgeous little clay figurines, all of which demonstrated a level of artistic skill that is at least the equal of the European masters of a thousand years later. The quality of the craftsmanship in gold, and the splendour of the Macedonian Sun resplendent on the burial caskets, is astonishing. A very good, if somewhat serendipitous – we had not sought it out – visit to a most interesting and beautifully displayed sight. An additional point of interest is that in the museum we met an Australian couple from Brisbane, 18 months out on an overland trip from Australia to Europe and back in a truck with a camper body. A very ambitious trip, taking in Russia, China and many of the ‘stan countries. Their web site is www.epicycle.com, but they are not doing it for any publicity purposes. Away then and back on the motorway again, where once we were down out of the hills we passed through less attractive surroundings, with a fair bit of industry featuring the often unkempt and ramshackle nature of Greek suburbia. We drove east from Thessaloniki along the low-lying strip that nearly separates the Khalkidhiki peninsula from the rest of Macedonia, and came in the early afternoon to another recommended free stop, on the fishing dock at the little village of Olympiada, on the shores of the Aegean. Not far to the south of us is an interesting place that we cannot visit – at least, Norma can’t and I would need advance permission via the Greek Consul in Sydney. This is Mount Athos, a small peninsula off the south-east coast of the Khalkidhiki peninsula. It is an autonomous republic ruled by the 1,700 monks who live in the 20 10th to 14th century monasteries. Only adult males may visit, but most tourists see the monasteries on a boat trip. Mount Athos itself is a peak at the tip of the peninsula, with the Gregoriou monastery perched precariously on a low crag at the sea’s edge. Quite hot at times in the early evening, with a gentle sea breeze, and a big thunderstorm grumbling away to the north. And flies – too much garbage and other rubbish lying around. Reasonable night, except that it started with the tail of the thunderstorm reaching us with no great consequences, and a couple of noisy motorcycles circling the car park later. Sunny clear morning, with a wind shift to the north. To start with, took a quite attractive route along the very northern end of the Aegean, and then rejoined the motorway before the big town of Kavala. Light traffic along the way, but had a fright when a small red car, as overtaking us, pulled in so early and sharply that Norma exclaimed and I had to take what limited evasive action was possible at the time. Shades of the minor collision in Romania a few years ago, and just another example of simple inattention; probably the phone rang. 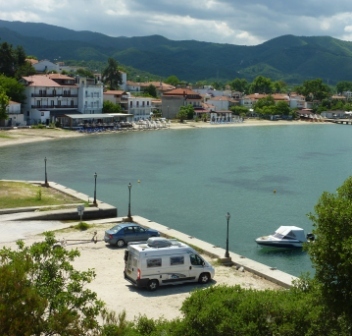 We reached the town of Alexandroupolis without further drama and pulled into the town’s municipal camping ground on the outskirts. This is the last town of any consequence before the border with Turkey, only about 40 km away. The camp site had been recommended (apart from being the only one anyway! ), and we needed a lay day to get organised after 10 days of pressing on quite hard all the way across Europe. We also knew it had wi-fi (but not that it was very slow and clunky), so that we could catch up with emails and the web. There is lots of vegetation, and the pitches are large. Norma spent the rest of the afternoon doing the washing, which included clothes last worn in Paris! Sun with light cloud cover, warming up by mid-morning. Yesterday and in the morning, more research on the situation in Turkey. Obviously, even before we left Australia only three weeks ago, we already knew that we had to keep an eye on the conflict in Syria, and the extent to which it might spill over into or otherwise affect our tour of Turkey. We were confident, and still are, that this will not be a problem as long as we do not go too close to the Syrian border, and that was the advice from the various government agencies that alert travellers to potential dangers – usually very conservatively. But the current problems facing the country are of purely Turkish origin. Briefly, protests began over plans to turn Gezi Park in Taksim Square, one of the few green spaces left in Istanbul, into a shopping mall. Several protesters were bludgeoned by police on 31 May and ended up in hospital. There was already resentment, especially among Turkey’s liberal young, about the dictatorial approach of the prime minister, Recep Tayyip Erdogan, and this boiled over as indignant protesters took to the streets of not only Istanbul but also other major cities including Ankara. The main television channels, which are owned by conglomerates friendly to the government, did not report on these early conflicts. This self-censorship only added to public anger. International concern at the actions of Erdogan and his government has caused police to withdraw from Taksim Square and the park, where protesters have since been building a tent city and set up an environment reminiscent, apparently, of Woodstock in the Age of Aquarius. There appears to be widespread public support for them, at least in the city. There is little likelihood of an early settlement, it seems to me. The fundamental concern is that the uncompromising religious conservative Erdogan is trying to “re-Islamise” Turkey, as otherwise exemplified by increasing strictures on the sale and drinking of alcohol and the reintroduction of head covering for women. The historical background is that in the 1920 the hard-drinking father of the nation, Mustafa Kemal “Ataturk” ended the caliphate and took Turkey in the secular direction of the west, outlawing the fez and the headscarf. This has evolved as far as promoting the present claims by Turkey that it should be a member of the European Union, a position bolstered by its far better economic situation than in many of the original members of the EU. So, the worry is over the prime minister’s intransigence and what he might do now: escalate the conflict with the protesters, who he is referring to with disdain and contempt, or take a softer line to cool emotions. But he is a hard line brinksman who aims to be the strong man of the region, which worries western nations as well as tourists like us. Currently, however, the official advice to travellers is exactly as it was a month ago: avoid demonstrations and you’ll be fine. That is what the British government is telling the (literally) millions of its citizens who are booked to visit Turkey this summer, and we have no reservations about pressing on and crossing the border tomorrow. Ironically, the only country whose government is warning its citizens to avoid travel to Turkey is Syria!